In the middle of a night of drinking, communal eating, and smoking with the neighbors, I looked out the window to see a giant flash of blue light followed shortly by darkness. It was lights out in the East Village! Still not the worst thing. We all thought the power would be back by midnight, or the morning at the latest. How wrong we were. Alphabet City, only a few blocks away, had cars floating up and down the streets. We woke up to downed trees, no traffic lights, no power, no hot water, no cell phone service, no internet, nothing. There were long lines for every pay phone and every open pizza parlor (because apparently disaster-readiness is not in the HipsterHandbook). No subways, no buses, taxis taking multiple fares — well, the taxi drivers who were nice, that is. It felt strange to be unconnected and completely cut off from the rest of the city. Before cellular service winked out, I managed to see that power was out from 39th Street down. That giant flash of light? A transformer explosion — which ConEdison now disputes, but what the heck else could it be? Aliens?! Once I found out that power might not be restored till the weekend, I did what any good little BaconBiscuit would do: I packed up my bacon and all of my frozen meats and sent them to a safe freezer in Brooklyn (Thank you, Niki and Dave!). Then I packed up and decamped to a friend’s luxury apartment on the Upper East Side. She has power, internet, hot water, cable television, and a dishwasher! Ooooh! Fancy! Seriously, it’s like the hurricane didn’t happen up here. I saw people at Gymboree and eating sushi! I bought brook trout at Fairway! Downtown? It’s like the great NYC Blackout all over again. I feel like a refugee in my own town, but am safe and sound. Thank you all for checking in! More photos of the downed trees behind my building below. I took them before my cell died! * Above, a photo of a corner one block away from home. Taken from the New York Times. Thank you! I’m glad that I had somewhere to go! Hey: I was going to offer you the option of decamping to chez les parents of SusaneatsLondon but it sounds like you are well-situated. Let me know if you need a place to stay; you can stay in the ROOM WHERE I GREW UP. Thanks, Steve! Hopefully NYC will be back and running in time for Gourmandistan’s visit! Glad to know that you have a place to stay. Thank you, Karen! I am glad too! It’s good to hear that you’re fine and that important things (read “bacon”) got taken care of. Stay safe! Glad you had friends to help you out. We don’t realize how dependent on electricity we are. So true! When I found out that the power would be out for days, maybe a week, I knew I had to go somewhere and stay with friends. We absorbed another downtown refugee last night after her building lost water! It is. I feel very disconnected from my neighborhood and my neighbors right now and am looking to having the power and water restored! Thanks! I hope that they restore power soon! I’m not sure you can ever make people happy. During Hurricane Irene, the city government was criticized for overreacting, now they are being criticized for not reacting enough! Good to hear what’s happening downtown. (Luckily, my mom is safe and sound here with me in Antalya.) And I have to admit that it was especially reassuring to know that no bacon was lost in the storm. I was just wondering about your mom and was hoping that she was okay. 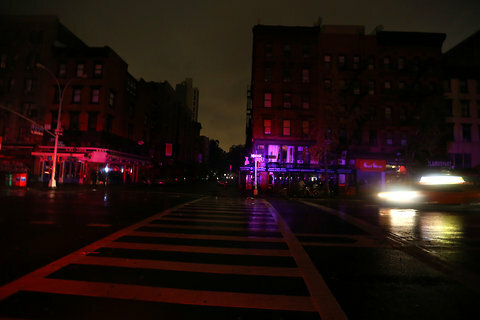 The East Village is still without power and being the paranoid-obsessive that I am, I feared zombie apocalypse downtown!